See the 2019 Winners Page! The judges reserve the right to limit awards in any category. Poster Entries must be postmarked or email time-stamped no later than January 25, 2019 to be eligible for the Driving the Message contest. Entry is open to high school and junior high students in the United States. Entries must address the issue of driving safety by focusing on one of the following risks teens face behind the wheel or as a young passenger – nighttime/drowsy driving, speeding, distractions, seat belts, impaired driving, pedestrian/bike safety, and/or driving dangerously around large trucks. Entries that display a dangerous or illegal activity will be disqualified, i.e. a video showing teens driving on a street while texting or not wearing a seat belt. Closed courses, with appropriate safety precautions are allowed – closed parking lots, private land with no traffic, being in a vehicle, while parked. Be safe, be smart. Entries submitted with evidence of illegal use of copyrighted material will not be considered for judging. The use of company logos and other product names (for cars, beverages, etc.) is also prohibited. Each student who submits an entry (poster) must submit an Entry Form. If you are part of a group/class submission, each student involved must have an entry form. Complete, signed entry forms must accompany entries. All person(s) whose photo appears in a poster entry must complete a video/photo release form. Complete, signed video/photo release forms must accompany entry. Judging will be based upon originality, creativity, and by how well you follow the messages that are central to the Teens in the Driver Seat® program. Entry must follow specs listed below. All entries become property of the Texas A&M Transportation Institute (TTI) and all or part of your entry can be used to advance and support the Teens in the Driver Seat Program or the Texas A&M Transportation Institute. The Texas A&M Transportation Institute is not responsible for lost, damaged, misdirected or delayed entries. 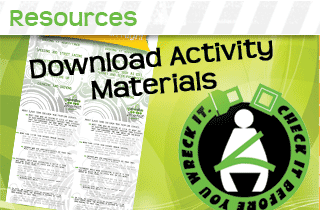 Teens in the Driver Seat® reserves the right to change any of these rules and/or prizes. Your poster can be any size, up to 11-by-17 inches. The poster must address the issue of traffic safety by focusing on one or more of the following topics – nighttime/drowsy driving, speeding, distractions, seat belts, impaired driving, pedestrian/bike safety, driving/walking safely around rail roads, and/or driving dangerously around large trucks. Poster should not include any copyrighted material (such as copyrighted images, photos or characters). Poster graphics should be original work. Posters that include downloaded, copied, or printed graphics from other sources will be disqualified. Posters must be submitted electronically, in PDF or JPG format. Emailed posters may be up to 5Mb, in PDF or JPG format, and ready to print. All entry forms and release forms must be emailed with poster file. Mailed poster files may be larger in file size, but must still be in PDF or JPG format and ready to print. No mailed printed posters will be accepted. Hand-drawn posters must be scanned and submitted electronically by email or mail, in PDF or JPG format, and ready to print. No mailed posters will be accepted. Posters will be printed, in color, for judging on 11×17 paper, at the largest. Teens in the Driver Seat is not responsible for quality of print. Electronic files will be printed as is. Winners in poster category will be required to provide original, high resolution electronic source files (300 dpi), with layers and fonts. We can accept Photoshop, Illustrator, or InDesign files. These files may be submitted with entry, if desired, but are not required with submission. Winning posters will be published for printing on 11-by-17 inch and smaller formats. Keep the message focus about teens and for teens. Always think about your end audience. We need your voice to spread the message about safe driving. Prize money is payable to entrant’s school, not the individual(s). Please review poster specs below before submitting entry. Submit entries in highest quality possible. Begin with high quality to end with high quality. This means low-quality phone pictures and video are not the best material to start with. Gruesome or gory entries do not fare well in judging and are not encouraged. Think positive safety messaging. Winning posters will be available for downloading and sharing. Please keep this in mind when creating. Send all questions to Stacey Tisdale at [email protected] Type CONTEST in the subject line. Do not use this email for entry submission. Please allow 3 days for reply. Entries must be accompanied with an entry form from individual or each person, if a group entry. Posters may be mailed on DVD, CD, or flash drive or emailed to [email protected], subject line CONTEST. Emails and mailed entries must be date-stamped no later than January 25, 2019. All entries from a school may be mailed together. Please make sure forms are clearly marked with corresponding entries. Poster file in PDF or JPG format. Entry form with signature. If poster is a group entry, each person must complete an entry form. Signed video/photo release form for all persons who appear on poster, if applicable. Packaging post-marked or email time-stamped no later than January 25, 2019. All emailed poster entries must include scanned copies of entry forms and photo/video release forms within email. If entries from a school are mailed together, please make sure forms are clearly marked with corresponding entries. Once the contest has closed, judging is completed by a panel of program sponsors, who independently review each entry. No school or student names are displayed with the entry. Judging is based on originality, creativity, and how well the safety message is portrayed. If your entry wins a place, you and your teacher will be contacted immediately after judging. Your school will need to submit paperwork (sent via email upon notification of winning) as soon as possible to claim prizes. Winners will be asked to submit original source files, if they were not submitted upon entry, as soon as possible.